DevOps is a philosophy that merges operations with development and demands a linked tool-chain of technologies to facilitate collaborative change. According to Gartner, organizations around the world are increasingly adopting the DevOps culture and by the end of 2016, 25 percent of top global 2000 organizations would have adopted DevOps as a mainstream strategy. This opens up myriad opportunities around DevOps careers. There are a variety of general and specialized job roles that one can take up, based on the DevOps philosophy. In this blog post let’s discuss DevOps Engineer career path and how to bag top DevOps jobs. Even though it is still in infancy, DevOps has brought the entire software industry on the brink of a revolution. With fast changing dynamics of the IT industry, developers who have no idea about admin or ops and admins or ops people who don’t develop will become less and less valuable to the organization. DevOps will transform a person with a single skill into a person with multidisciplinary skills that includes coding, infrastructure and configuration, testing, build and release. Since it is not confined to any specific technology, people working in DevOps environment continuously work with, integrate, and automating different technologies. DevOps practitioners are among the highest paid IT professionals today, and the market demand for them is growing rapidly because organizations using DevOps practices are overwhelmingly high-functioning. According to a very recent report published by Puppetlabs: State Of Devops Report, organizations using devOps approach deploy code up to 30 times more frequently than their competitors, and 50 percent fewer of their deployments fail. 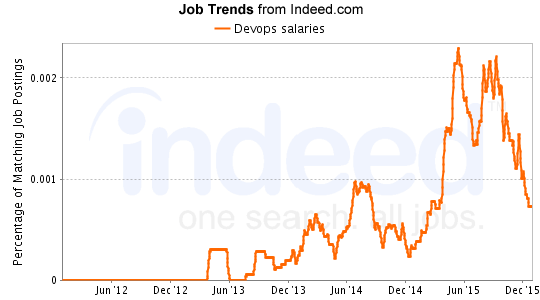 In the last two years, listings for DevOps jobs on Indeed.com increased 75 percent. On LinkedIn.com, mentions of DevOps as a skill increased 50 percent. In a recent survey by Puppetlabs, half of their 4,000-plus respondents (in more than 90 countries) said their companies consider DevOps skills when hiring. 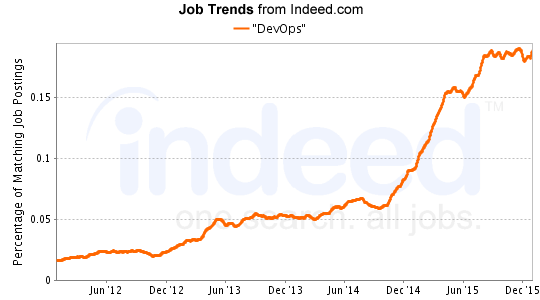 As it is evident in the Indeed.com graph below, DevOps jobs began skyrocketing around middle of 2015, and shot through the roof towards end of the year. Salaries for DevOps related jobs saw an upward surge in the US, coinciding with the boom in in 2015. The surge still continues. 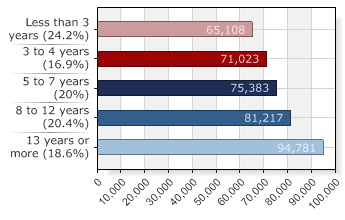 According to PayScale.com, salaries for professionals working on DevOps related jobs in California are upwards of $94,000. Strangely, unlike jobs in other technologies, DevOps is witnessing an interesting trend. All the popular job titles on DevOps share very similar job opportunities. For instance, if a project management role saw 65,760 openings, budgeting roles provided 64,859 openings. 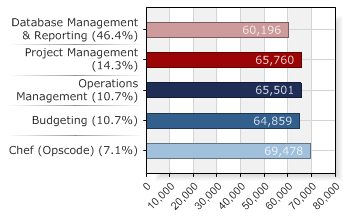 Jobs around popular DevOps tool – Chef – were marginally higher at 69,478. What began as a framework and ideology for bringing together two diametrically opposite schools of thought within the same organization, is today a popular career path with perks and growth opportunities increasing by the day. There’s never been a better time to explore a DevOps Engineer career path. Get started with DevOps training now to take advantage of the opportunities that come your way. Edureka has specially curated Devops Online Training that helps you master concepts around Puppet, Jenkins, Ansible, SaltStack, Chef among others. New batches are starting soon!! Got a question for us? Please mention them in the comments section and we will get back to you. The Hype Behind BIG DATA! ParrotOS vs Kali Linux: How to choose the Best?